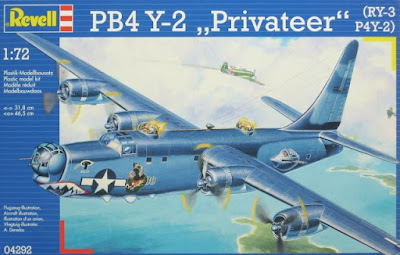 Revell Germany have recently reissued the old Matchbox Privateer/RY-3 kit and included a decal option they claim is "Consolidated C.IX Liberator (RY-3) of No.168 Squadron Royal Canadian Air Force, Rockcliffe, Ontario, Canada, 1947." The serial is JT997. This is rather odd, as the RCAF only flew one Liberator C.IX, JT973 the "Rockcliffe Ice Wagon." (Matchbox included decals for the Ice Wagon in their kit, so I just assumed Revell would do the same when it was announced that RCAF decals were included in the kit.) The description is even more confused, as not only was JT997 never on RCAF strength, 168 (HT) Squadron never operated the C.IX. (They only operated twin tailed Liberators.) In addition, by 1947 JT997 had been returned to the US Navy by the RAF and 168 (HT) Squadron was dispanded. Odd. My guess is Revell found a pic of JT997 serving with 45 Group Ferry Command in Canada and just made up the rest. Even with the decal confusion it is nice to see the Matchbox RY-3/Privateer back in production, as the kit was commanding really high prices on the secondary market. If you really want to go whole hog and get the best out of the kit, Cobra Company has a very nice resin set available at a price. Don't forget, Ron's Resins made corrected cowlings for those who don't go for the Cobra Company set. Some people might have both sets. (Don't ask how I might know that). Thanks for starting of this look at RY3, since this kit is on my modelling table for some weeks now I do not know what to do next also info about them is scarce. but otherwise the kit is up to temptation to build it. Where I can find at least some pictures of RY or C.IX? Agree with DG - the Ron's Resins engines are nice of you want to build an RAF/RCAF aircraft and don't want lots of left over resin from the Cobra Kit. I did hear that HIghplanes had taken over the range.